Zeiss continues to fill out their Milvus Lens lineup and in this case, it was one of my favorite Zeiss Classic lenses that received the make-over, the Zeiss 15mm f/2.8. Included in the Milvus update are beautiful looks and really impressive, top-of-the-line build quality including weather sealing. This lens feels at least as good in your hands as it visually appears and it mechanically functions with similar or even higher quality. Does the last primary component of this lens, the image quality, also match? Read on to find out. Some Milvus lens models get a new optical design while others borrow from their predecessor. This lens falls into the latter category, inheriting its optical design from the Classic Lens, but that news didn't concern me as all. The 15 Classic was/is an excellent lens and while the Milvus refresh brings a very-nicely-improved lens overall, few will feel compelled to upgrade from the older lens for similar image quality. 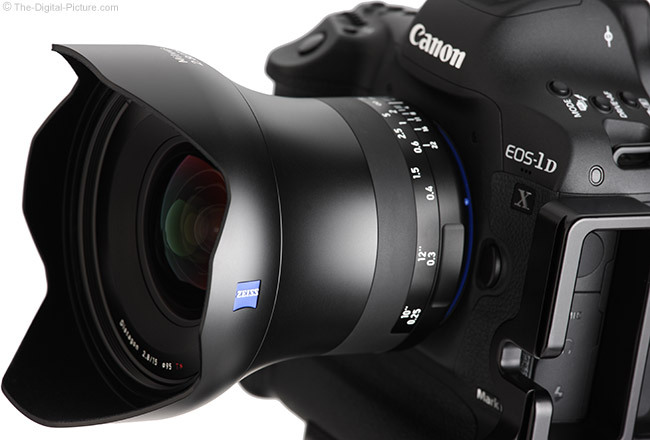 Before reading any further, you need to know that this lens, like all other Zeiss Milvus lenses, is manual focus only. 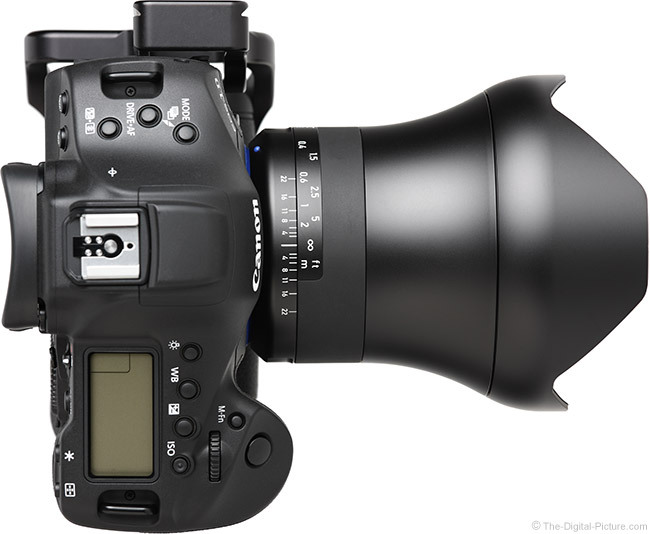 If autofocus is on your requirements list, this lens will not satisfy your needs. If you think a manual focus only lens might work for your applications (it works fine for a large percentage of 15mm needs), keep reading. As always, you should pay close attention to the focal length (or focal length range) when selecting a lens, either to purchase, to rent or to simply select from your kit for immediate use as different focal lengths have different applications (with some overlap, of course). The 15mm focal length is ultra-wide on a full frame body, taking in a 110° diagonal angle of view. What is the 15mm focal length used for? Landscape, nightscape, architecture, real estate, interiors and environmental portraits are some of the first answers to come to mind. I'll start with the landscape application as that is one of my favorites. If for no other reason, embracing landscape photography provides a great excuse to go outside. 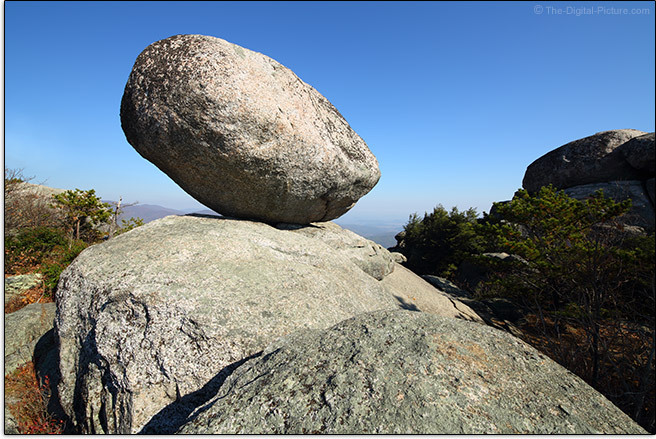 Courtesy of the Zeiss 15mm Classic Lens, I take you to the reward of a 2,500' (762m) climb – a great view and a large balanced granite rock on Old Rag Mountain in Shenandoah National Park. The top of Old Rag Mountain provides an exceptional view, but the far away subjects in such views are not necessarily photogenic due to haze and lack of contrasting and/or interesting details. This particular mountain is so high above the distant surroundings that sky and foreground become the primary available subjects. The clear blue sky was beautiful, but I wasn't wanting a large amount of it in the frame. So, I quickly found the boulders to be a favorable subject. The Zeiss 15 allowed me to move in very close to the huge rocks, making them large in the frame relative to the other far more distant objects. Keeping everything in an expansive scene in focus is also an attribute this focal length bring with it. There is going to be a lot of background in most 15mm images and details in that background are going to be rendered small, usually recognizable and likely completely in-focus. Even when focused at the minimum focus distance with a wide open aperture in use, background details often remain recognizable. This attribute is perfect for landscape photography and vast, beautiful scenes begging to be captured with a 15mm lens are found globally. Another great use of the 15mm focal length is to create panorama images with the complication of multi-image panorama capture and stitching techniques skipped. If you don't need to print longer (or higher) than your DSLR has native resolution for, simply shoot with a wide angle and crop to the aspect ratio you like. Here is a Canon EOS 5D Mark III-captured, single-frame, wide-format image of the Manhattan skyline captured at 15mm. Notice how straight the buildings are in this example? Shooting level to the horizon is key to this result as converging lines come into play when shooting upward or downward. Angle the camera up or down and the buildings will appear to be leaning strongly inward or outward respectively. Using the converging line principal to your advantage is also possible. 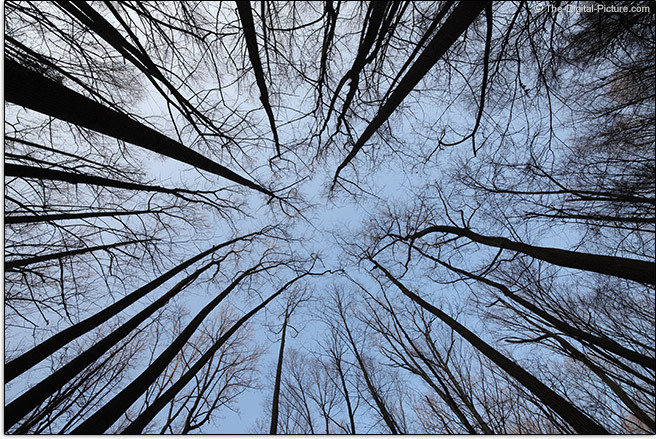 Shooting upward into trees is one common use of this positive use of converging lines. The keeping the camera level in certain scenarios topic segues nicely into another good use of this focal length. 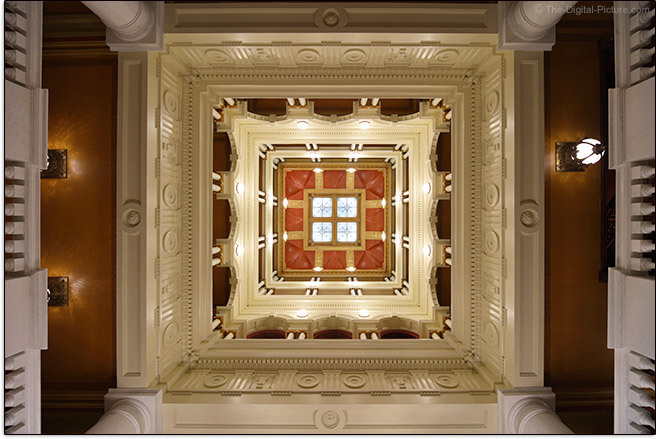 As mentioned, architecture and real estate photography can make use of the 15mm angle of view and often a level camera will be desired for vertically straight lines in these pursuits. The interiors application can be included in real estate photography, or it can be part of an event shoot. Wedding photographers want to capture the big picture of the venue, inside and outside. This lens can check that shot off of the list. While most lenses can be used to capture people, the wide angle of view provided by 15mm lends itself best to environmental-type portraits, showing a subject along with their surroundings. Get too close and people start looking distorted due to perspective. This focal length can work well for group portrait photography, but avoid having some subjects closer to the camera than others as those in the front may end up appearing larger than those in the back. You've likely seen even professional family pictures captured with a young child on the mom's lap appearing much larger than the dad positioned in the back. Don't do that. People participating in sports can be captured using ultra-wide focal lengths. Lenses such as this one are great to use for remote cameras at the starting line, finish line, in the goal, over the basket, etc. There are many other uses for the 15mm focal length. Often, if you can't back up far enough to contain the desired subject, an ultra-wide angle might be what is needed. To see how 15mm fits into the neighboring focal lengths, I'll borrow a comparison example from the Canon EF 11-24mm f/4L USM Lens review. Some of my favorite images were captured at the 15mm (or similar) focal length and I'm guessing this focal length could add some nice imagery to your portfolio (if 15mm is not already covered in your kit). A 15mm lens on an APS-C/1.6x format DSLR delivers an angle of view similar to a 24mm lens on a full frame body. This AOV is an even more-commonly used one for landscape photography and other more-general-purpose uses and composing great 24mm images is easier than composing great 15mm images. Considerations must be made when using a 15mm focal length with flash. Since 15mm is wider than most flashes natively cover, a diffuser (either built in or accessory) or bounce flash (or similar) will be required to avoid an only partially lit scene. The f/2.8 aperture is relatively wide for 15mm with only a small handful of lenses within +/- a mm having a wider aperture. The most remarkable of those surpassing f/2.8 at this time is the Sigma 14mm f/1.8 DG HSM Art Lens. Allowing more light to reach the sensor permits freezing action, handholding the camera in lower light levels and/or use of a lower (less noisy) ISO setting. While 15mm frame-filling action should be avoided in many cases for safety reasons – the subject will be MUCH closer than it appears through the viewfinder. This lens' wide apertures are very useful for stopping more-distant action in low light venues such as churches and under the night sky (the rotation of the earth being the common nighttime concern). The minimum shutter speed required for sharp handheld photos is based on the rate at which details on a subject are moving across the pixels on the imaging sensor. That movement can be subject-caused, or it can be the photographer's motion (in the form of camera shake). Because of the wide AOV (Angle of View), subject details are often rendered small and the movement of such covers fewer pixels. Thus, this lens can often be handheld at relatively low shutter speeds which means in low light and/or with narrow apertures. In addition to allowing more light to reach the sensor, increasing the aperture opening permits a stronger, better subject-isolating background blur. However, an ultra-wide focal length is not going to be a first choice when a strongly blurred background is a high priority. 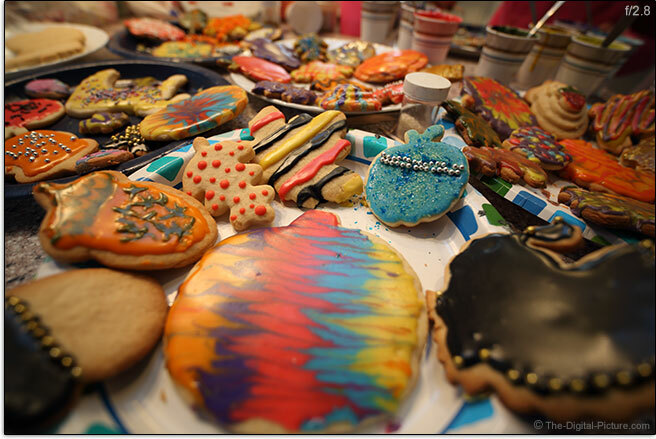 Fall includes an annual destruction of the Carnathan kitchen, also known as cookie production, and that event provided a subject to illustrate the 15mm background blur potential (courtesy of the 15mm Classic). The blue apple (if I'vew identified it correctly) with little silver balls is the point of focus. The full size 5D Mark III images show stronger blur (the blur is enlarged), but as previously discussed, objects are identifiable throughout the frame even at f/2.8. Here is an outdoor max-blur sample picture captured with the Milvus lens. I'm sure that you can figure out what is in the photo. I owned the Zeiss 15mm f/2.8 Classic Lens for years and still love the image quality this lens produced. It is simply stellar. With the Milvus update getting the same optical design, I expected a copy-and-paste image quality discussion. However, I'm still struggling with this one. The first lens was not up to our expectations so, as usual, we tested another. With the second still falling short, we brought in a third lens that, unfortunately, appeared similar to the first two. The first three lenses were retail-acquired, so I opted for a Zeiss loan to get the fourth copy. I was certain that lens would be optimal, but in the end, was least satisfied with this one (#4 in our image quality test results). We've now tested four copies of this lens and none have completely matched the performance of my Zeiss 15mm Classic. My expectation bar was set very high, but ... logic says that I should expect at least the same image quality from the Milvus. Let's start with the positive. At f/2.8 the center of the frame is quite sharp at f/2.8 and it is razor sharp by f/4. Stopping down further does not improve center sharpness and ... it doesn't need to. Following is an outdoor scene illustrating the center-of-the-frame performance. These images were captured in RAW format and processed in Canon's Digital Photo Professional using the Standard Picture Style with sharpness set to "1" (on a 0-10 scale) and cropped to 100% resolution. The following examples are from the center of the frame. The center performance looks great. Add a 1 to the sharpness setting and the f/2.8 results will look like the f/4 results. All four lenses turned in exceptional center of the frame performance. The corners are where I'm troubled. Corners are rather soft at f/2.8 and they do not become remarkable even at f/11. Here are 100% resolution crop examples taken from the extreme corner of the frame, starting in the top right, then the bottom-right and the last set taken from the top-left. The above results are about average for what I'm seeing from corner performance. The lens borrowed from Zeiss turned in a good top right corner if manually focused in the corner at relatively close focus distances. Unfortunately, this lens' focus ring appeared to not provided enough adjustment past infinity to focus the left corners. Also unfortunate is the apparently not flat area of sharp focus, leaving the center of the frame blurred when the corner is in best focus. The Zeiss 15mm Classic lens was one of the best corner-performing wide angle lenses I've owned. Why this one is so much worse is a conundrum. Yes, misalignment could be a cause of the issues we are seeing, but the lenses showed good symmetry and receiving four misaligned lenses in a row is a big issue. If these results I'm seeing are truly indicative of the performance of this lens model, most are going to find the cost:performance ratio simply too high. Wide angle full frame lenses always show peripheral shading when full frame imaging sensors are behind them and the max-wide aperture is in use. In this case, there is a quite noticeable, but not unusual, 3.5 stops of shading. About 2-stops of shading remains at f/4 and a modestly-noticeable just over 1 stop remains from f/5.6 through f/16. 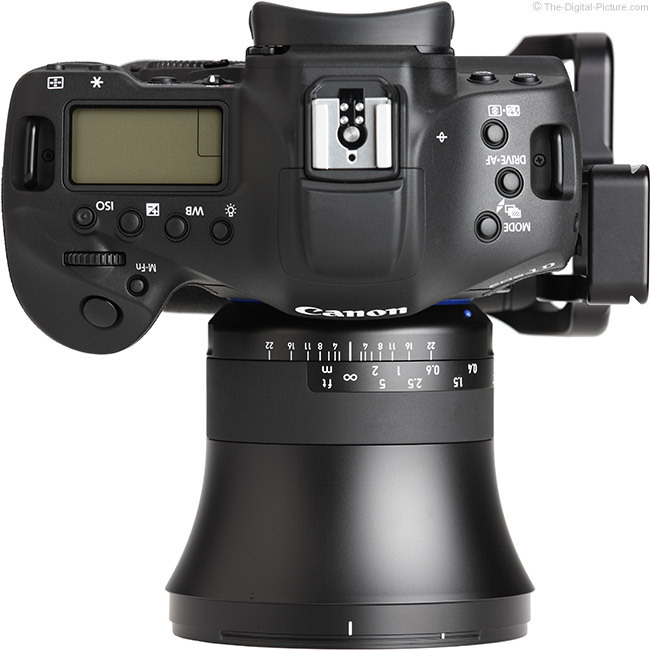 Mount this lens on an APS-C body and there is much less to worry about in regards to peripheral shading. The just-over-1-stop of shading in f/2.8 corners will be, at most, slightly noticeable in most images. The effect of different colors of the spectrum being magnified differently is referred to as lateral (or transverse) CA (Chromatic Aberration). Lateral CA shows as color fringing along lines of strong contrast running tangential (meridional, right angles to radii) with the mid and especially the periphery of the image circle showing the greatest amount as this is where the greatest difference in the magnification of wavelengths exists. 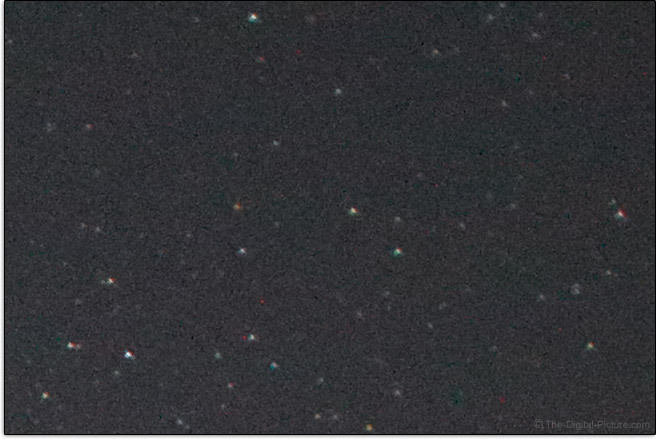 It is not atypical for extremely wide angle lenses to show strong amounts of lateral CA in the periphery, and while this lens indeed shows some color fringing, the amount is not terribly strong even as seen in the extreme corner of an EOS 5Ds R image as shown below. 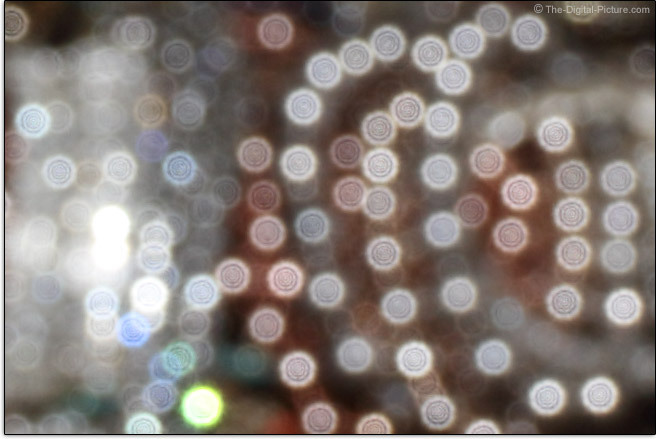 Another relatively common lens aberration is axial (longitudinal, bokeh) CA, which causes non-coinciding focal planes of the various wavelengths of light, or more simply, different colors of light are focused to different depths. Spherical aberration along with spherochromatism, or a change in the amount of spherical aberration with respect to color (looks quite similar to axial chromatic aberration but is hazier) are other common lens aberrations to look for. Axial CA remains at least somewhat persistent when stopping down with the color misalignment effect increasing with defocusing while the spherical aberration color halo shows little size change as the lens is defocused and stopping down one to two stops generally removes this aberration. 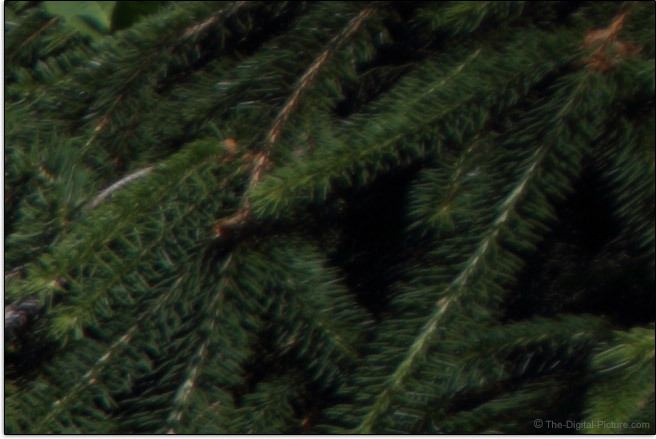 In the 100% resolution crop samples shown above, look for specular highlight fringing color differences in front of and behind the plane of sharp focus. In this sample, those colors remain similar, a very positive attribute in regards to the just-described aberrations. The Zeiss 15mm Milvus lens does a great job at controlling flare. Even stopped down with the sun in the corner of the frame, this lens shows only minor flare effects. While flare effects can be embraced for their artistic look, I much more frequently want to avoid them and it is sometimes extremely difficult to remove these effects in post processing. A 15mm lens with a wide aperture raises its hand for consideration as a night sky lens choice. Among other desired features, the corner performance of the lens is a differentiator and coma and astigmatism are often-found corner deficiencies. Coma is generally recognized by sharp contrast towards the center of an image and long, soft contrast transition toward the image periphery. 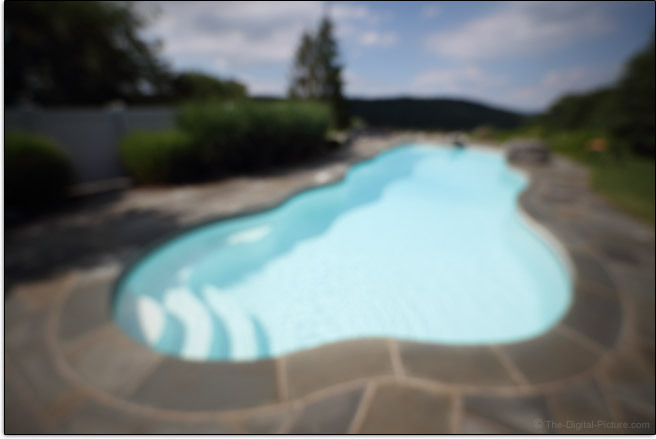 Coma is most visible in wide aperture corners and significantly resolves when the lens is stopped down. The above image was taken from near the top-right corner of the frame. The Zeiss 15mm Classic lenses was one of the best night sky options available and this one should be the same. While these stars appear round, showing this lens having potential, the f/2.8 peripheral image sharpness issue comes into play. The Milvus 15 has a slight amount of barrel distortion. 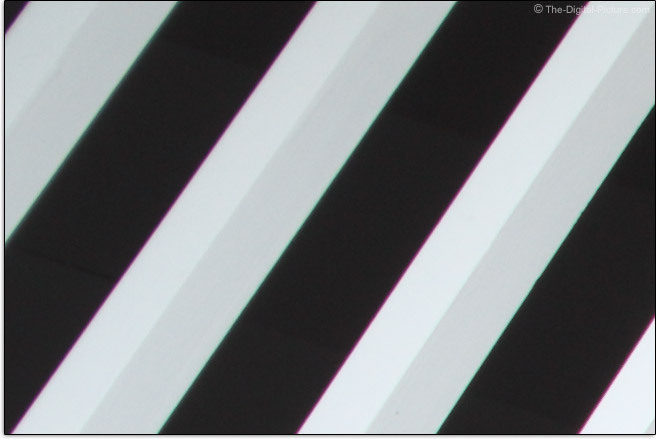 If your image has peripheral lines running parallel to the frame border, they will show a slight amount of curvature. Otherwise, you will not likely notice any geometric distortion. A 15mm f/2.8 lens is not going to create a tremendous background blur, but the quality of this lens' blur (bokeh) is good. 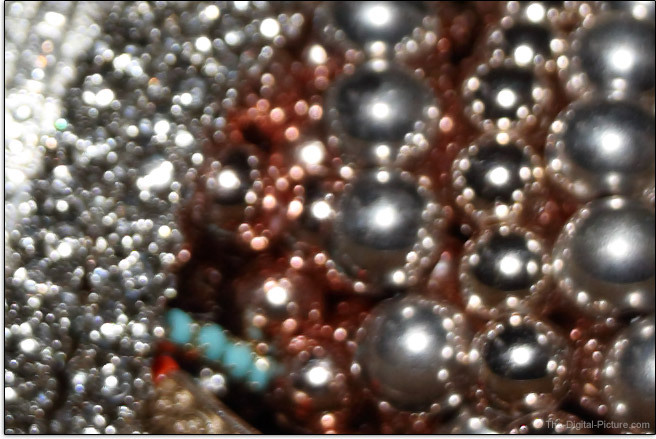 Here are some f/8 examples of out-of-focus specular highlights. Both examples are 100% crops. The specular highlights show some dark concentric circles, but the borders are rather round and smooth. The outdoor example shows a smoothly-blurred background. As mentioned, I don't think we are seeing the expected corner image quality from the Zeiss 15mm Milvus lens. Omit that (important) issue and this lens is optically an impressive performer. There is a touch of barrel distortion and vignetting is showing in normal strength for this lens class, but flare performance is great. 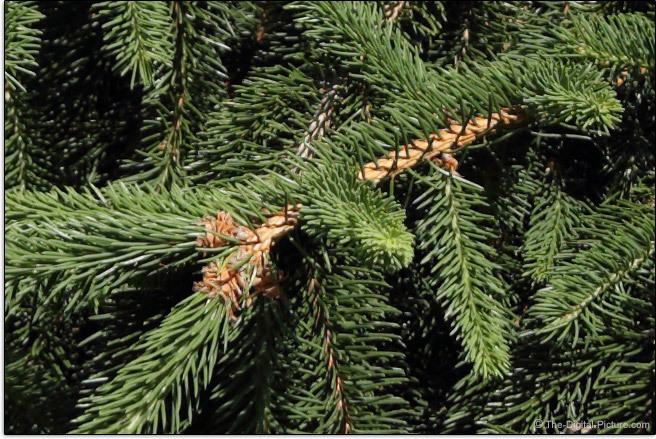 A touch of lateral CA shows, but axial and spherical aberrations are very well controlled. There are no concerns in using this lens wide open for center sharpness reasons. Image quality is highly dependent on accurate focusing and, with all manual focus lenses, including the Zeiss Milvus line, that accuracy is completely in your hands. Fortunately, Zeiss Milvus lenses deliver the ultimate manual focusing experience and this one is just like its focal-length-nearest siblings. The extremely smooth focusing ring has a broad 120° of rotation, making very precise manual focusing available at all focus distances. The focus ring diameter is flush with the lens barrel with a modest size, consuming the rubber-coated portion of the lens and the very well-marked focus distance values behind it. Fortunately, it is not too difficult to find the focus ring as it is located just behind the outward-tapering section of the lens. The focus ring resistance is ideal and there is no play. Few non-Zeiss lenses are as nice to manually focus as the Milvus lenses. As with all Milvus lenses, just past infinity and minimum focus distances are hard stops. That feature means that focus distance settings/marks are easily repeatable, an attribute highly valued by videographers. 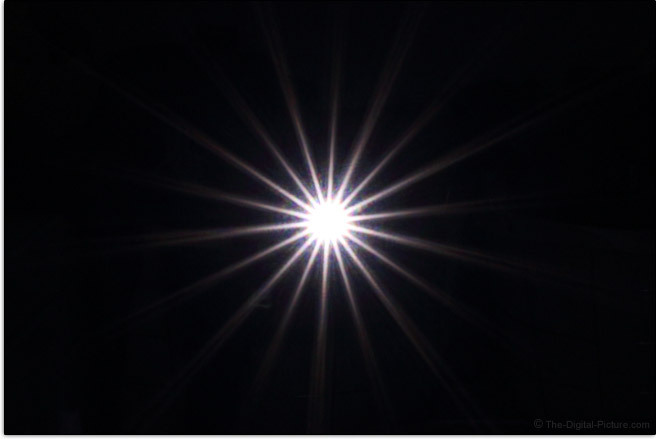 Distant subjects (such as stars) are typically sharp just prior to the hard stop at infinity due to adjustment latitude provided for the actual infinity focus position to potentially change with temperature. The Zeiss Milvus 15 provides a full DOF (Depth of Field) scale including aperture marks covering the full aperture range, including f/2.8. While some other non-Zeiss lenses include depth of field markings, few provide markings covering even moderately wide apertures. Subjects change size very slightly as this lens is focus racked from one extent to the other. While this attribute is not unusual, photographers intending to use focus stacking techniques involving focus distance adjustment, videographers pulling focus and anyone very-critically framing a scene care about this attribute. I don't consider myself to be the best manual-focuser when using today's stock viewfinders (I need the old split-prism feature), and while the in-focus indicator light will come on in the viewfinder when the camera thinks that accurate focus has been acquired, this is an imprecise indication. Ideal is to use live view under maximum magnification where very precise manual focusing can be very reliably established. The downside of course is that not all situations permit use of the magnified live view method. I often use wide angle lenses such as this one to take in the bigger picture and in those cases, depth of field can be very deep and I generally have very good success with manual focusing using only the optical viewfinder or the distance marks on the lens. The Zeiss 15mm f/2.8 Milvus Lens' 9.8" (250mm) minimum focus distance delivers a relatively low 0.11x maximum magnification. The lenses covering this focal length range have a wide variation in the max magnification spec with this lens falling toward the bottom of the list and the zoom lens options, aided by their longer focal lengths, taking the top positions. Often, a lens' minimum focus distance can be reduced via extension tubes. However, on lenses this wide, even a 12mm extension tube reduces the minimum focus distance too much for the lens to be usable. With the lens focused to infinity, the maximum focus distance appears to be somewhere closer than the front lens element. Spend a lot of time with a camera in your hands and you appreciate having a quality lens. All of the Zeiss Milvus lenses feel like precision instruments and simply using them makes the day better. All photographers can appreciate the aesthetically pleasing curved lines they incorporate. 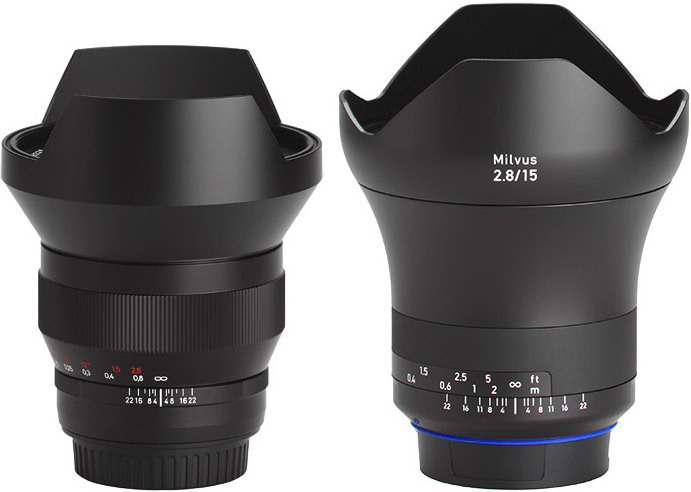 Here is a look at the two Zeiss 15mm lenses with the Classic lens appearing on the left and Milvus on the right. The design changes brought about by the Milvus modernization update are very strong and the external changes are obvious. 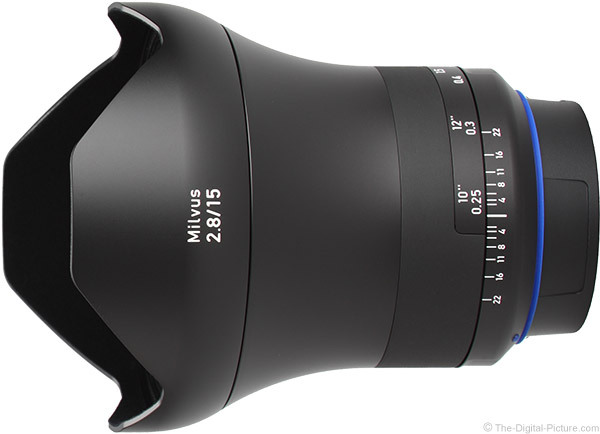 We first saw the fundamentals for the new Milvus design with the introduction of the Zeiss Otus line. The Milvus lens series has inherited the smooth overall flow and the smooth rubber focus ring is similarly Otus-like. All lettering and other markings on this lens are etched into the metal lens barrel, focusing ring and lens hood. Having the focal length and aperture easily visible on the hood is especially nice, making lens ID easier (especially if one also owns other similar Milvus lenses). This is a solidly built lens featuring an all-metal exterior, seemingly ready for generations of professional use. This lens is fixed in size. New with the Milvus upgrade is a removable lens hood. If you ever had a filter get stuck on the 15mm Classic lens (raises hand), you can appreciate the easier access to the end of the lens made available by this feature. Though the hood is removable, it is a solidly-built metal piece that is beautifully-designed to look and feel like a permanent part of the lens and it becomes a natural part of the grip surface when installed. The interior surface of the hood is flocked for maximum reflection avoidance. Without autofocus, image stabilization, a zoom range or any other similar features, this lens needs no switches and that leaves nothing but focus ring and lens barrel. Just enough fixed lens barrel is available behind the focus ring to grasp for mounting and dismounting. Another new physical feature for this lens, one that is common across the entire Milvus line, is dust and moisture sealing. Of course, Zeiss made even this feature visually attractive with a classy blue rear gasket. 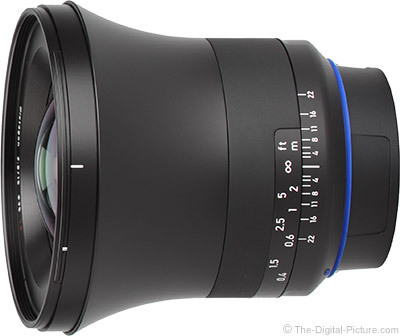 The Zeiss Milvus 15 is a medium-small lens that is sized nicely for use. A strong build quality often shows up on the scales and this lens is a heavyweight in its class. With a weight similar to the largest zoom lens options covering 15mm, this is the heaviest prime lens in the comparison list. For many more comparisons, review the complete Zeiss 15mm f/2.8 Milvus Lens Specifications using the site's Lens Spec tool. Put the hood on and the Milvus 15 dwarfs much of the competition, though the Irix 15's objective end and large hood make it appear more-similarly-sized. Use the site's product image comparison tool to visually compare the Zeiss 15mm f/2.8 Milvus Lens to other lenses. If you need to use a standard-threaded front filter, at review time, no full frame lens wider than 15mm will natively fit that requirement. While accepting these front filters is a very positive feature, the 95mm filter size means that compatible filters are both large and expensive. They are, however, growing in popularity with some of the large telephoto zoom lenses making use of this size. 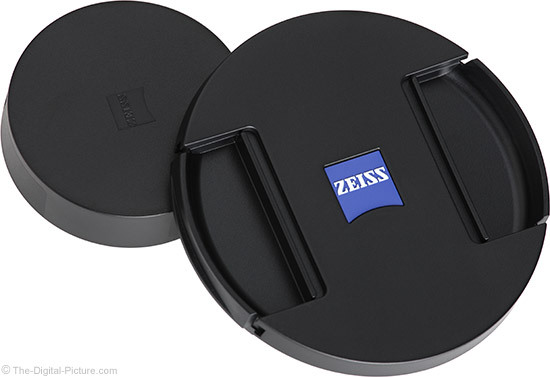 Zeiss delivers this lens in a very nice box. Remove the outer box sleeve to find a somewhat large but very protective hinged box with cut-out foam cradling the lens and hood in place. While the out-of-the-box experience is a good one, the box is not an ideal solution for easy-access storage or carry protection. Pick up a Lowepro Lens Case for a good quality, affordable and more compact lens transport and carry solution. 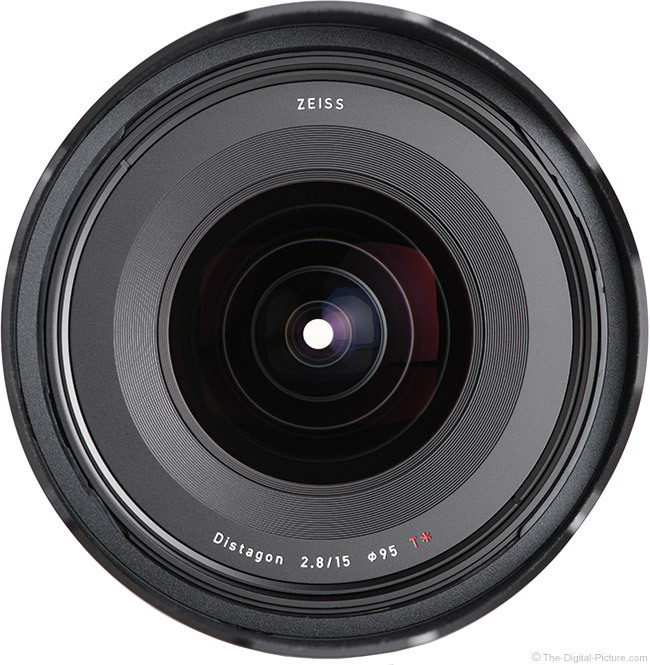 You've never heard anyone say that they bought a Zeiss lens because it had a low price. Zeiss lens buyers are discerning photographers who know the importance of reliability and quality and are willing to pay what it takes to get such. There is great value in having a lens reliably get the job done. Still, I have a very hard time justifying the very high price of this lens relative to the image sharpness it delivers. 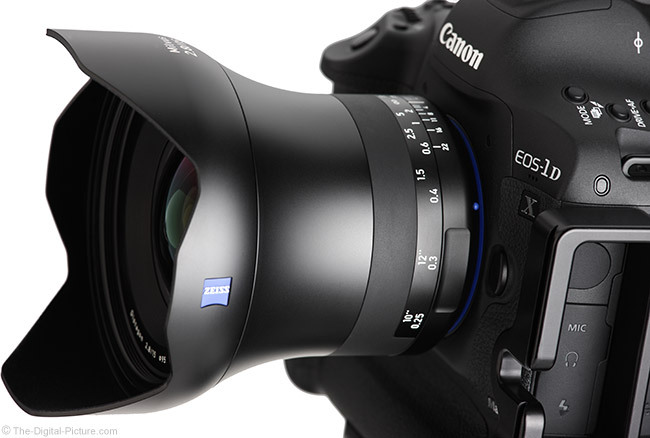 The Zeiss Milvus 15mm f/2.8 Lens is available in Canon (reviewed) and Nikon mounts. I always include my standard disclaimer, warning of potential issues when using non-camera manufacturer brand lenses. Since the Zeiss Milvus lenses do not include autofocus, I view the risk of incompatibility in existing or future camera introductions as being quite low. Zeiss Milvus lenses include a 2 year warranty. Three of the reviewed Zeiss Milvus 15mm f/2.8 lenses were retail/online-sourced and the fourth copy was borrowed from Zeiss. From a build quality perspective, this lens outclasses all of the current competition and that includes the focus ring performance. The price tag of this lens is also significantly higher than any of the current similar focal length f/2.8 alternatives. I will not repeat these differences in the individual comparisons, but they are significant and should be included in considerations. It is said to have the same optical design as its predecessor, but ... the Zeiss 15mm f/2.8 Milvus Lens is not performing quite as well as the Zeiss 15mm f/2.8 Classic Lens, a lens I owned and loved for years. The Zeiss 15mm f/2.8 Milvus compared to Zeiss 15mm f/2.8 Classic Lens image quality comparison shows the Classic lens turning in modestly sharper corners than the best of the Milvus lenses tested. They use same lens design, but not the same lens coatings and the Milvus lens better avoids flare. The Milvus lens has weather sealing and a removable lens hood. The specification comparison shows that the Classic lens is modestly smaller and lighter and, while still available, appears to be a bargain. Having the same prime lens focal length and available at a bargain price is the Irix 15mm f/2.4 Lens, available in your choice of Firefly (light, lower cost) and Blackstone (more robust) versions. The Zeiss 15mm f/2.8 Milvus compared to Irix 15mm f/2.4 Lens shows the two lenses turning in similar center of the frame results and the Irix winning the corner competition, including having less lateral CA. The Irix shows more flare effects. The Irix has a modestly wider aperture available. The specification comparison shows that the Irix Blackstone is the noticeably lighter lens (and the Firefly is lighter still). The Irix is also smaller. Another lens covering 15mm and f/2.8 is a zoom, the Tamron 15-30mm f/2.8 Di VC USD Lens. While the zoom range is an obvious advantage, the VC (Vibration Compensation) and auto focus capabilities are additional strong advantages this zoom lens has. In the Zeiss vs. Tamron image quality comparison, I see the Zeiss winning, especially in the mid-frame and corner areas. Stop down and much of the Zeiss advantage disappears. The Zeiss has much less linear distortion and shows considerably less flare effects. The Tamron has noticeably less peripheral shading. The specifications comparison shows the Tamron lens being considerably longer and primarily because of the longer focal length, it gains a higher maximum magnification spec of 0.20x vs. 0.11x. In its 14-24mm focal length range, the Sigma 14-24mm f/2.8 DG HSM Art Lens covers the being-compared 15mm f/2.8. In the Zeiss vs. Sigma image quality comparison, the Sigma is the clear winner. The Zeiss shows less distortion, but keep in mind that the Sigma would be performing better at 15mm than it does at the 14mm focal length we tested. In the Zeiss vs. Sigma specification comparison, we see the Sigma weighing slightly more and, though slightly narrower, it is similar in length with the Zeiss lens hood being included in the measurement. Primarily because of its longer focal lengths, the Sigma has a higher max magnification spec (0.19x vs. 0.11x). The Sigma does not accept standard threaded front filters but has the auto focus advantage. Open this competition up to 14mm prime lenses and we pick up another handful of competitors. 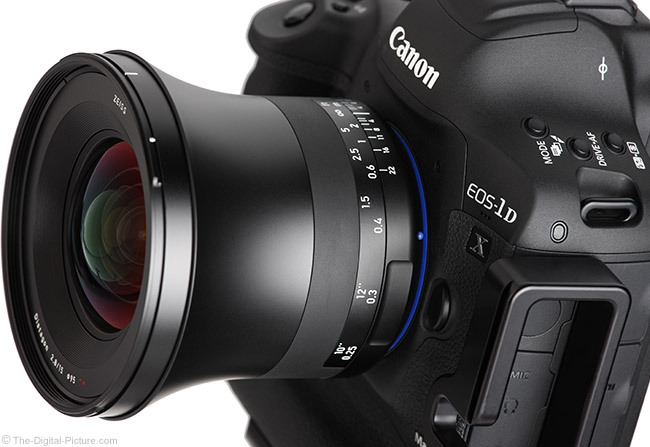 Canon-based kits of course have the Canon EF 14mm f/2.8L II USM Lens to consider. The Zeiss 15mm f/2.8 Milvus vs. Canon EF 14mm f/2.8L II USM Lens image quality comparison shows the Zeiss being sharper in the center and mid frame, but the Canon looks better in the corners. 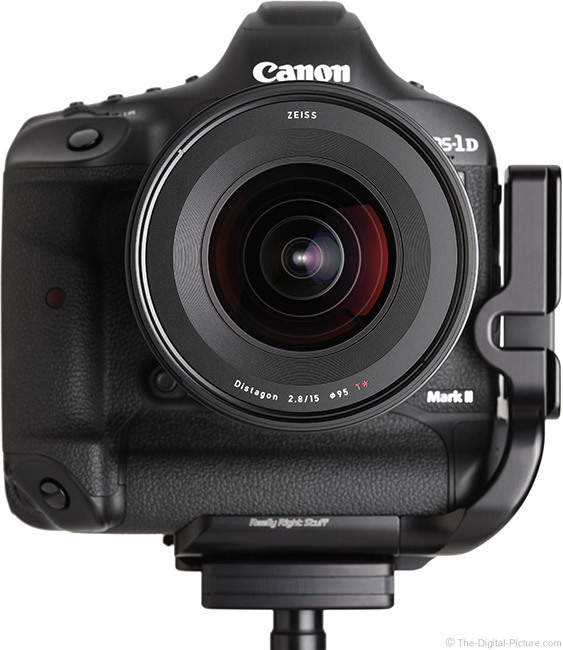 The Canon has modestly less peripheral shading and barrel distortion and shows more flare. The specs comparison shows the Canon's smaller size and lighter weight. The Zeiss has more aperture blades (9 vs. 6) and accepts standard threaded front filters while the Canon features auto focus. As I wrap up the Zeiss 15mm f/2.8 Milvus Lens review, I am deep into the Rokinon AF 14mm f/2.8 Lens review and this lens is a very relevant comparable. In the Zeiss vs. Rokinon image quality comparison, I see the Zeiss lens holding a center of the frame advantage at f/2.8 (mostly gone at f/3.2), but the Rokinon has better corners and shows less lateral CA. The Rokinon has a bit stronger peripheral shading and noticeably stronger barrel distortion. The Zeiss vs. Rokinon specification comparison shows us that the Rokinon weighs just over 1/2 as much as the Zeiss and is considerably smaller. Also, a 20% shorter minimum focus distance gives the Rokinon a maximum magnification advantage (0.15x vs. 0.11x). The Rokinon does not accept standard threaded front filters but offers the auto focus feature. Launched prior to the Rokinon AF 14 was the premium-grade manual focus Rokinon SP 14mm f/2.4 Lens. The Zeiss 15mm f/2.8 Milvus vs. Rokinon SP 14mm f/2.4 Lens comparison shows the Zeiss again holding a center of the frame advantage at f/2.8, but the Rokinon has better corners and less lateral CA. The Zeiss has slightly less vignetting, shows milder flare effects and has much less linear distortion. In the specs comp, we see the Rokinon being the lighter weight lens. 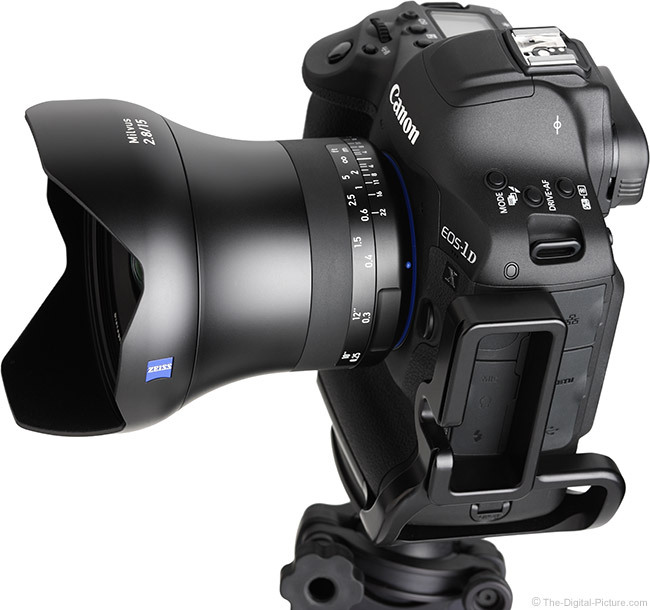 With its hood attached, the Zeiss is larger. 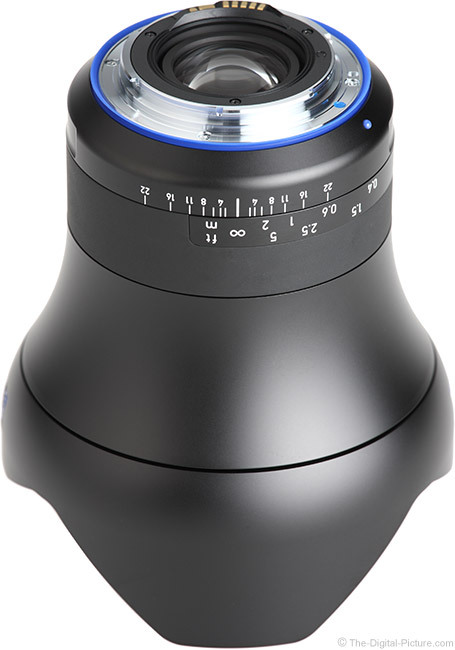 The Zeiss accepts standard threaded front filters, is weather sealed and, in a battle for the bottom, has a higher max magnification (0.11x vs. 0.08x). The Rokinon's focus ring rotates 232° vs. 120° for the Zeiss and the Rokinon has a slightly wider aperture. At the bottom of the price descending list is the manual focus, manual aperture Rokinon (Samyang) 14mm f/2.8 IF ED UMC Lens. In the image quality comparison, the Zeiss is sharper in the center while the Rokinon holds a very slight edge in the corners, mostly from a lateral CA perspective. The Zeiss shows noticeably less peripheral shading, less flare and considerably less distortion. 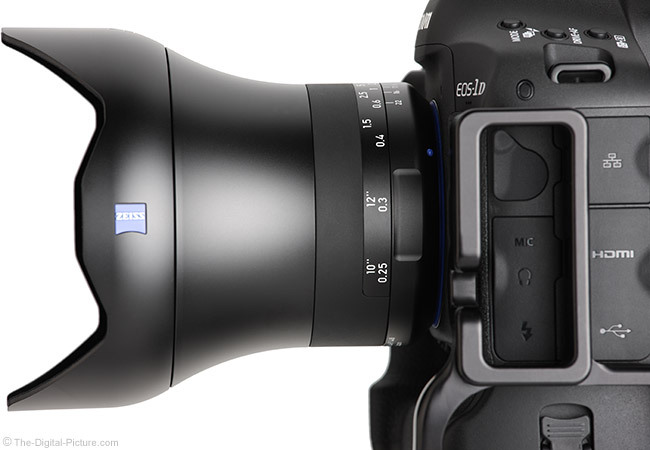 Comparing specifications, we see the Zeiss as the noticeably larger and heavier lens. The Zeiss accepts standard threaded front filters, is weather sealed and has 9 aperture blades vs. 6. A lens that turned heads upon hitting the streets was the Canon EF 16-35mm f/2.8L III USM Lens. This lens does not have 15mm in its arsenal, but it delivers really impressive image quality down to 16mm. In the Zeiss vs. Canon image quality comparison, I see the Canon having a slight edge in the center of the frame and a clear win in the periphery, including with much less lateral CA. The Zeiss has less peripheral shading, slightly more flare and less barrel distortion. Comparison specifications, the Canon is noticeably lighter, a bit narrower and somewhat longer. The Canon does not focus quite as closely as the Zeiss, but with 35mm available, it turns in a considerably higher maximum magnification (0.25x vs. 0.11x). The Canon's 82mm filter size is considerably smaller than the Zeiss' 95mm size. There are many other lenses that could be considered. Use the site's comparison tools to aid your research. This lens' predecessor, the Zeiss 15mm f/2.8, was one of my all-time favorite lenses and I very much looked forward to evaluating the Milvus version. Unfortunately, this evaluation became a very time-consuming one with four different lenses being examined. I can't make a lens look any better than it really is and, while this lens is really sharp in the center of the frame, I can't make the corners shine and that leaves me wanting, especially relative to the lens I previously owned. If these lenses truly have the same optical design, something happened to degrade the image quality. If the center of the frame is where your concern lies, this lens brings excellence. The design and build quality of this lens is simply beautiful and arguably unsurpassed in its class. Outside of peripheral image quality, this Milvus lens leaves little to want.